The location has this status until one of the Clans is the first to bring their troops there or until they dislodge the troops of another Clan already located there. 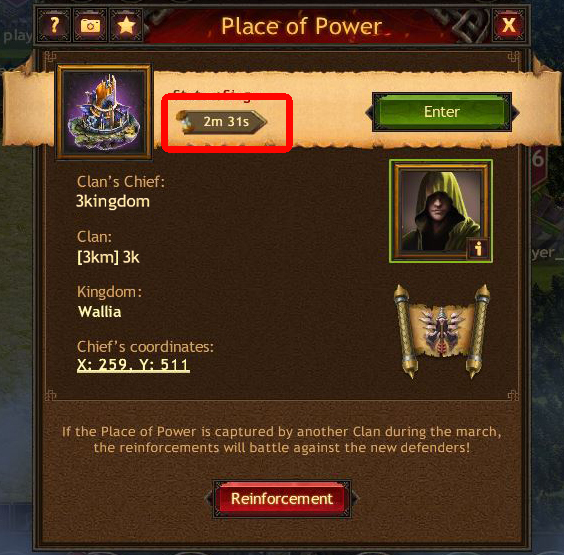 The Place of Power acquires Siege status as soon as one of the actions mentioned above has taken place. At this point the timer starts to run for 6 hours. During this period the Place of Power can be attacked by other Clans attempting to capture it. If during this period the players are unable to dislodge the troops of the Clan located there, the Place of Power acquires Guarded status. If the attacking players manage to dislodge the Clan players protecting the Place of Power, the Siege status timer is reset to zero and starts again for another six hours. 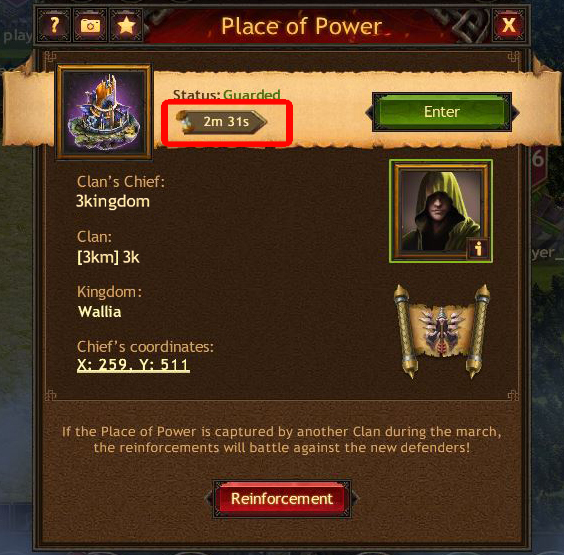 The Place of Power acquires Guarded status only if the Clan that captures it manages to hold it for 6 hours. After Guarded status is set, the timer starts to run for 24 hours. During this period the Place of Power cannot be attacked, which is why enemy troops sent before the onset of Guarded status return to the Town of the corresponding player. If the troops that arrived at the Place of Power belong to the same Clan, they start to protect the location. After 24 hours the Place of Power returns to Open status, which remains until the troops of an enemy Clan dislodge the troops protecting the Place of Power, at which point the location acquires Siege status again. Note that you have to plan your attacks wisely when capturing the Place of Power. Send only the best warriors to help your clansmen, as a maximum of 50 reinforcements can be at the Place of Power.